Overcoming traditional professional boundaries in the design proces, the infratructural projects represented by these models and drawings integrate the talents of architects, engineers, and artists. 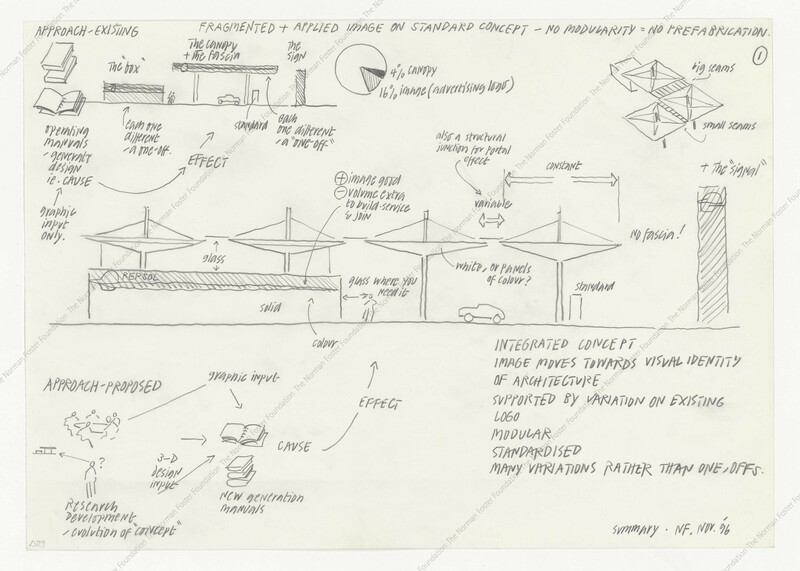 The works displayed in the Infrastructure Archive Gallery consider infrastructure's role as the vital connective tissue of the city and thereby explore its capability to contribute to the quality of life and character of the built environment. A selection of projects representing this idea is presented in this collection, under the same name. The Hammersmith Centre represents the first semi-public commission by Foster for a multimodal transit exchange and commercial development in London. The site model demonstrates the way in which the scheme located offices on the perimeter and created a raised internal plaza above the rail and bus halls. 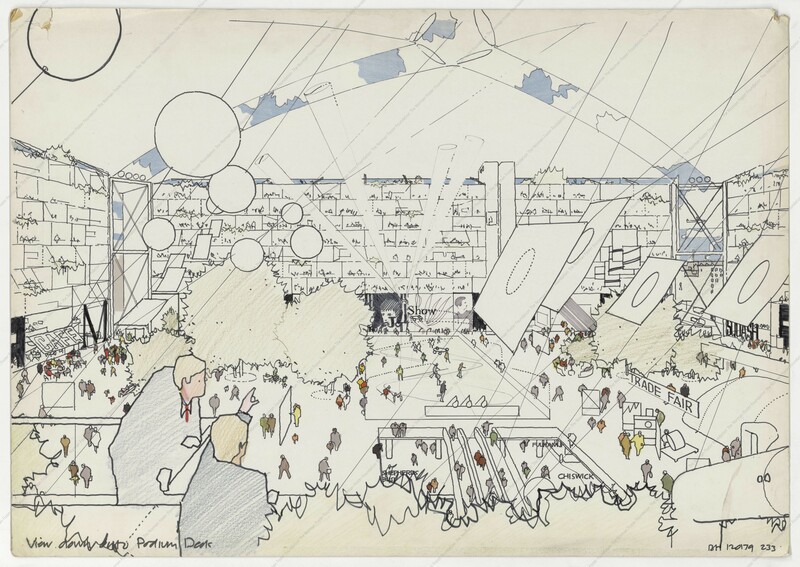 Recalling elements of the roof terrace of Willis Faber & Dumas and the light filled atrium of Buckminster Fuller's Climatroffice, the sectional drawings suggest the vibrant public space that was to be created at the heart of the otherwise functionally demanding site. Another selected work for this collection, the Bilbao Metro system, visibly announces its presence through the expressive, sleek glass and steel entryways that emerge out of the ground below. Beyond creating a visual icon for Bilbao's new metro system, the project concentrated much of its ingenuity on the less glamorous but highly impactful design elements of the underground. Against the precedent of labyrinth stairways, passageways, and platforms, the sectional model for the station attests to the way in which the Bilbao Metro streamlines descent into a station in which circulation and platform are integrated within the ovoid section of the train tunnel. Much like Foster's early Fred Olsen Passenger Terminal or later airport projects, the Bilbao metro thereby aims to improve the pedestrian experience of transport by reinstating intuitive navigation. The project further exemplifies this interdisciplinary approach to urbanism given Foster's collaboration on the project with renowned graphic designer Otl Aicher who created the Metro system's signs, maps, and visual identity. Through these efforts, the Metro has since become not only a desperately needed functional asset to the city but also a broader symbol of its post-industrial renaissance since the 1990s. In preparation for the broadcasting of the 1992 Olympic Games, the city of Barcelona undertook a large investment in new telecommunications infrastructure. Rather than dispersing the many new satellite dishes and towers, the sketches for Torre Collserola explore consolidating the clutter of telecommunication systems in a single structure. The Tower further attempts to create a flexible built framework that will accommodate future manifestations of rapidly changing telecommunications infrastructure. Rather than consigning the Torre Collserola to a mere infrastructural necessity for the 1992 Olympic Games, the model attests to a new landmark integrated into the landscape surrounding Barcelona. The Repsol Service Station project represents a commission of over 200 petrol service stations built across varied contexts in Spain. The project builds off of the new visual identify for the Repsol brand in the attempt to both better the experience of these service sites while creating a distinct icon for the company through its architecture. In this way, the often-separate elements of sign, gas pump, service area, and store are reimagined within a holistic design scheme. The resulting canopy echoes the service trees of Stansted airport, announcing its roadside presence through its bottom lighting and the distinct colours of Repsol's branding. The modular nature of the individual pyramidal, multi-height canopies allows for flexible configurations according to the size of the service station site.